Dame June Whitfield - celebrated for her comic roles in BBC sitcom Terry and June and cult favourite Absolutely Fabulous - has died aged 93. The London-born actress was a regular fixture on TV and radio for six decades, starring in Carry On films, Hancock's Half Hour, and even Friends. At 89, she appeared in EastEnders as Sister Ruth, a nun with a secret about Kat Moon. At 92, she was made a dame. Her agent said she died peacefully on Friday night. Tributes to her long and successful career in comedy are being made on Twitter. Julia Sawalha, who played her strait-laced granddaughter in Absolutely Fabulous, said Whitfield had been a "great source of inspiration" to her as a young actress but was "far too humble to accept my adoration". Fellow Ab Fab actress Joanna Lumley told ITV news she was "heartbroken to lose such a darling friend", who would "always have a most special place in my heart". She said she would never forget "her sensational talent, humour and her generosity". Jane Horrocks, who played the ditzy character Bubble in the comedy, said her former co-star was a "wonderful lady", who was "versatile, funny and generous". Most of Whitfield's scenes during her three episodes on EastEnders were filmed opposite Jessie Wallace, who tweeted: "A truly great actress and comedy legend. Working with June was a masterclass." 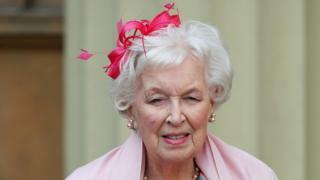 Impressionist Rory Bremner called Whitfield the "go-to comedy actress for three generations". TV producer Jon Plowman, who worked on Absolutely Fabulous, said there was "no-one with a better ability to just 'place' a line, always an act of utter precision". Speaking to BBC Radio 5 live he described working with Whitfield: "You would hand her a script, she would work out where the laughs were and then would very quietly wipe the floor with everybody else." Comedian Miranda Hart recalls a touching encounter with Whitfield who responded to an appeal for sponsorship for Edinburgh Festival early on in her career. And broadcaster Danny Baker said Whitfield was "formidable, dependable, inimitable. A rock. A gem." Shane Allen, controller of BBC Comedy, described Whitfield as "the North Star of British comedy". "Her spectacular career is unparalleled in its longevity, with seven decades of being a key element in numerous high profile and successful shows. She was the go-to female comedy performer of her generation and was always in demand from the cream of British comedy." Often playing the female stooge to some of Britain's most famous entertainers, she called herself "a comic's tart". The actress always said she was "very bad at getting round to things".